Simon Mignolet as Liverpool's player of the season - not as crazy as it sounds? 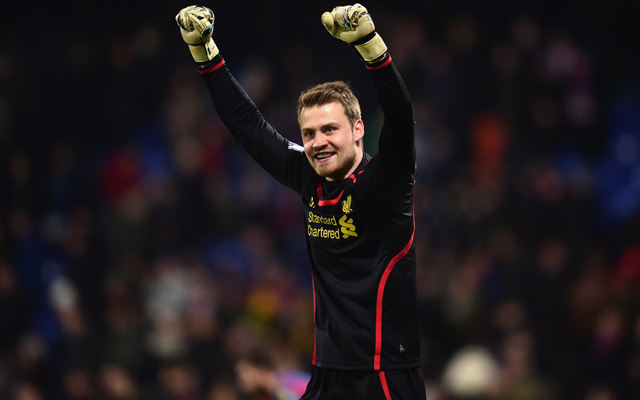 Simon Mignolet as Liverpool’s player of the season – not as crazy as it sounds? The Liverpool Echo made waves on social media on Sunday with their suggestion that Simon Mignolet should win the Reds’ player of the season award, following an exemplary run of form since the turn of the year. It’s fair to say that the assertion received a mixed response, with one tweeter even suggesting that the ‘coach driver’ would be a more deserving recipient. Nonetheless, Mignolet’s recent record definitely deserves recognition. Saturday’s goalless draw against West Bromwich Albion took the Belgian to 14 Premier League clean-sheets this season, more than any other top flight goalkeeper and one ahead of his nearest rival – Southampton’s Fraser Forster. Since the turn of the year alone, he’s helped keep out the opposition on 13 occasions in all competitions, a remarkable turnaround considering that he was dropped ‘indefinitely’ from the team back in December. As the Echo’s Neil Jones explains: “At that point, a little over four months ago, the Belgian’s Anfield career was at rock bottom. Dropped indefinitely for Brad Jones, he was the symbol of Liverpool’s demise, a nervous wreck, spreading unease throughout a struggling side. The difference in Mignolet’s performances either side of Christmas is certainly astonishing. In 2014, you were scared to see the ball go anywhere near him, certain that another calamitous error was fast-approaching. He had little or no control over his own penalty area, flapping at crosses and sending panic surging through his defenders. In 2015, he has been outstanding. His countless number of world class saves were decisive to our exceptional run of form at the start of the year, while he now deals far better with coming out to grab the ball and organising his defence quickly at the breakdown. Only Philippe Coutinho has been more consistent, as proved by his recent PFA nominations. But while the Brazilian has been equally as excellent throughout the entire campaign, he’s never felt that same pressure on his shoulders. Let’s not forget that at the end of last year, Mignolet’s Liverpool career looked all but over. The Reds were being linked with a different goalkeeper almost every day in the build-up to the January transfer window (via BBC Sport), while Rodgers was preferring to select Jones, a keeper with a small number of Premier League appearances throughout his career, between the Anfield posts. His confidence was at an all-time low. Regardless of whether it was thinking less or any other gem of advice from his wife (via The Guardian), whatever he changed has worked. Over the course of four months of hard work he has restored the confidence of his manager, teammates and the majority of supporters. During a season when so many players have fallen short of the incredibly high standards set last season, we should celebrate the ones that haven’t. Chief among them, is Simon Mignolet.